Above average soap. 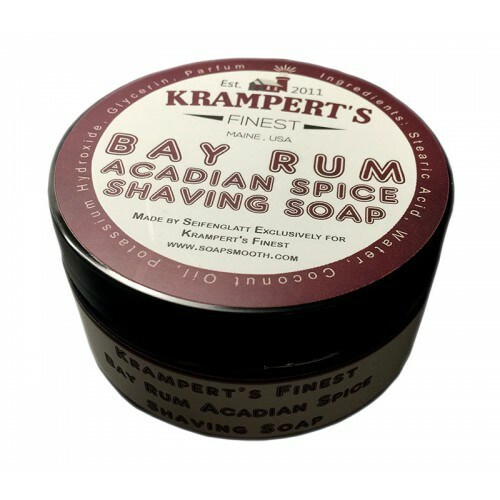 I like the Bay Rum. It could be stronger, but not sure how that would effect the already tingling-inducing lather. Good lather. Whips up easily. Don't start with too much water; add slowly and you'll be rewarded with a nice, thick lather. Before I have finished my second pass, I notice a slight tingling sensation. I have experienced far worse with some other soaps. This tingling isn't annoying, simply noticeable. Good. Average. Updating this to 4 stars. Once the optimal ratio of soap to water is discovered, the slickness improves as well. Bay Rum shouldn't be shy, and unfortunately, this scent is timid. Sticking with this assessment. Value is very subjective. In this case, 4 star value. Bump a star. I am going to get a lot of shaves from this jar. Definitely an above average shave soap. Nice tub. Again, new label from that pictured above.